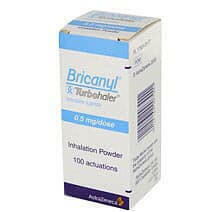 You can order a Bricanyl Turbuhaler online from YouDrugstore, an online Canadian pharmacy. When you purchase from us you pay the same price most Canadians pay. To complete your order online, all you have to do is register on our site and send us your prescription so our professional health care team can review it. You can even ask your doctor to fax us your prescription directly to speed up the process. We will then ship your order directly to your mailbox for a cheap shipping cost after we have received all of the necessary information. YouDrugstore also provides free shipping on all orders over $100. Order your medications from YouDrugstore today and manage your asthma condition effectively. Bricanyl Turbuhaler contains the generic medicinal ingredient terbutaline, which belongs to a group of drugs called bronchodilators. As the name suggests, these drugs relax certain muscles in the airways in the lungs and makes breathing easier for patients with breathing disorders such as asthma. Why do doctors prescribe Bricanyl Turbuhaler 0.5mg? Doctors prescribe Bricanyl Turbuhaler to relieve breathing difficulties among people with asthma, chronic obstructive pulmonary disease, bronchitis and emphysema. Terbutaline stimulates the beta 2 receptors in the lungs, thereby causing the muscles in the airways to relax and open so it is easier to breathe. It relieves symptoms such as wheezing, cough and shortness of breath and is effective even if you have an acute asthmatic attack. Each Turbuhaler contains multiple doses of micronized terbutaline sulfate. When you inhale from the Turbuhaler, you draw in one dose of medicine, specifically 0.5mg. It is important that you inhale as deeply and strongly as you can through the mouthpiece. This medication usually works within five minutes and lasts for up to seven hours. More than six inhalations (3.0 mg) should not be required in a 24-hour period. These may not be all the side effects of Bricanyl Turbuhaler 0.5mg. Do not use use Bricanyl Turbuhaler if you are allergic to terbutaline sulfate, have a fast or irregular heartbeat, or for the treatment of preterm labour or miscarriage. Before you inhale this medication, let your doctor know if you have an irregular heart beat, chest pain, high blood pressure, diabetes, hyperthyroidism, or seizures. Terbutaline sulfate is sensitive to moisture so store your Turbuhaler in a dry place at room temperature. Keep it out of the reach and sight of children. Always replace and tighten the cover after using your Turbuhaler. Asthma is a long-term lung condition causing symptoms like wheezing, chest tightness, shortness of breath and coughing. In the United States, more than 25 million people are known to have asthma. People with asthma have inflammation or swelling in the airways. In addition, the muscles can react to certain substances and further narrow the airways, making it very difficult to breathe. Although asthma has no cure, medication can help manage the condition.